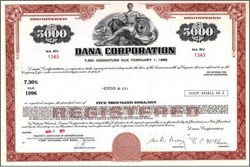 Beautifully engraved certificate from the Dana Corporation issued in 1971. 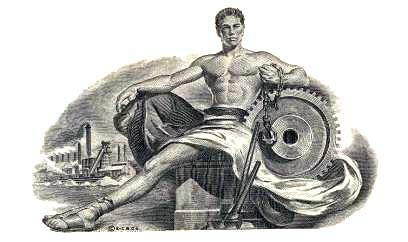 This historic document was printed by the Security Columbian Banknote Company and has an ornate border around it with a vignette of an allegorical man holding a chain infront of a mill. This item has the printed signatures of the Company�s President and Secretary and is over 30 years old. Dana Corporation is one of the world's largest suppliers of components, modules and complete systems to global vehicle manufacturers and their related aftermarkets. Founded in 1904, and based in Toledo, Ohio, the Company operates some 300 major facilities in 34 countries and employs more than 75,000 people. The Company reported sales of $12.3 billion in 2000.